This entry was posted on November 19, 2018 by Christopher Martin. 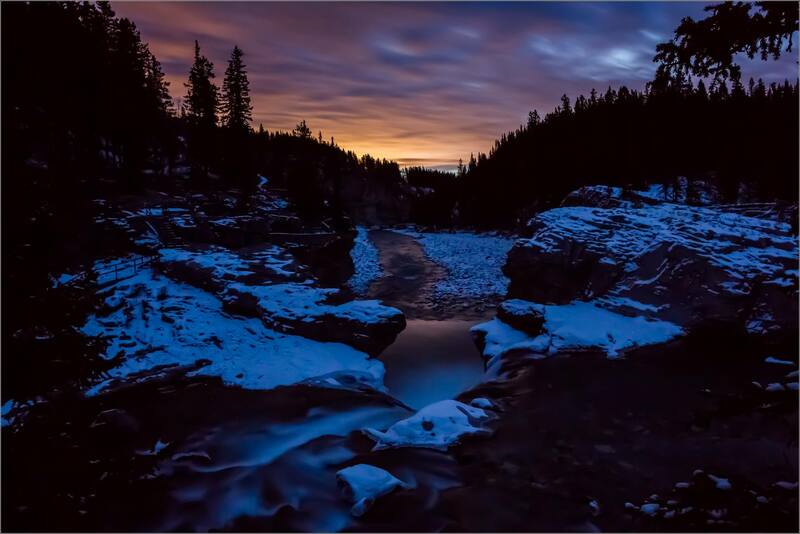 It was filed under Kananaskis, Landscapes, Night Photography, Sunrise . What a unique and beautiful photo! Thank you for sharing this experience with us. Thank you Ree! I hope you find lots of great things to photograph. I’m glad you liked this image. All the best and happy shooting! So light pollution has its advantages! Very pretty and I find myself wondering if Elbow falls are the same falls I first saw many years ago in Banff on the trails behind the famous Banff Springs hotel. Hi Jane! The Elbow Falls are along Highway 66 in Kananaskis. A pretty waterfall about 15 minus west of Bragg Creek. I think you are recalling Bow Falls which are just below the Banff Springs Hotel. Those are really pretty in winter when the ice forms. And here I thought YYC was code for some mysterious photographic technique I’d not yet come across. Now, I’m sending smiles from south of IAH and HOU! Once I got that sorted out in my mind, I could attend to the photo: beautiful and uniquely lit. Lol! If I come up with a new technique, I’ll use that name – it works!